Look what we found for you on Amazon! I have a similar Cheese Grater/Citrus Zester that I use often for cooking. I also use it for grating garlic and ginger regularly. Hurry and get the Lemon Zester, Cheese Grater, Parmesan Cheese, Ginger, Garlic, Chocolate, With Razor-Sharp Stainless Steel Blade, Protective Cover and Cleaning Brush, Dishwasher Safe，by NSpring today for only $9.99 $2.99 from Amazon! That’s a crazy low price! Limit 3. Check out all of the Amazon deals here! Amazon Prime members get FREE 2-day shipping!! If you are not a Prime member, get FREE shipping when you purchase $25 or more of eligible items across any product category. Check out the Cheese Grater/Citrus Zester details below. Practical design, handy to use and easy to clean. Our zester grater has a food-grade stainless steel blade that will not get rusty over time. Non-slip grip handle protect you at any time. Protective cover of the blade is easy to put on or take off. Hanging hole makes this easy to store and save space. The grater is dishwasher safe, and you also can wash it by hand, rinsing it under running water. Multifunctional kitchen tool, suitable for most fruits and vegetables, such as chocolate, ginger, garlic, cheese, cucumber, potato, carrot, Parmesan Cheeses, Reggiano, lemon, orange, limes and citrus. 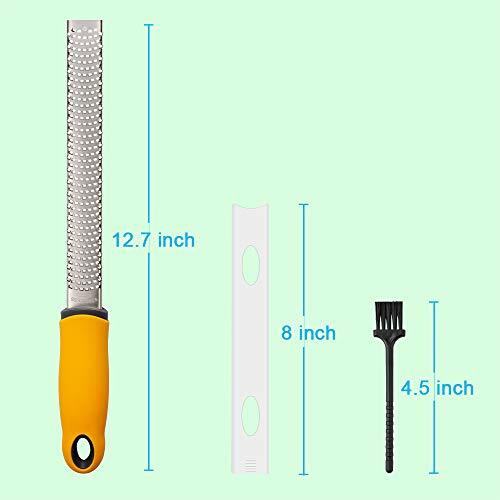 Buy the Lemon Zester, Cheese Grater, Parmesan Cheese, Ginger, Garlic, Chocolate, With Razor-Sharp Stainless Steel Blade, Protective Cover and Cleaning Brush, Dishwasher Safe，by NSpring from Amazon.